What has 18 tentacles, 9 beaks, 72 arms and thousands of color changing cells? It’s the cuttlefish exhibit in the New England Aquarium’s Tropical Gallery! 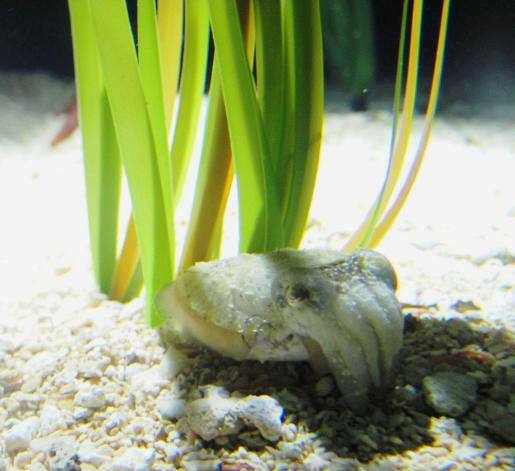 Located on the first level of the exhibit area, the cuttlefish exhibit is currently home to nine dwarf cuttlefish (Sepia bandensis). These small, four inch relatives of squids and octopuses are cephalopods, meaning “head-foot.” And they do look like they are just that: a head and a bunch of feet! Most noticeable on the front of their bodies are their two feeding tentacles and eight arms that they use these to snare prey, like shrimp and small fish. Once the food is caught, the cuttlefish breaks up the food with their hard beak and it’s snack time! 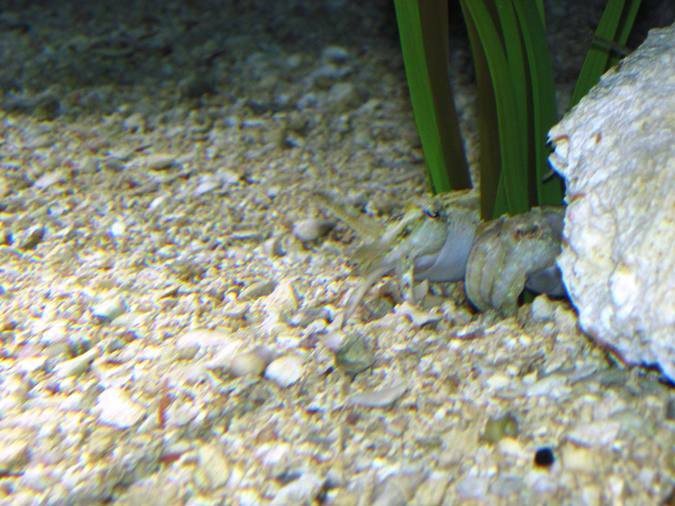 How many cuttlefish can you find? Resembling small flying saucers, cuttlefish use a flexible fin and jet propulsion to move both vertically and horizontally in the water! They also have the most amazing ability to change their appearance with thousands of color-changing cells all over their skin. It’s thought that cuttlefish use their color changing abilities to aid in communication, mating and to mesmerize prey. Check out the video below … if you look closely, you will be able to see the cuttlefish change the color pattern of its skin! And while this entry was being written, the cuttlefish went and did something that makes the exhibit even more amazing-they laid eggs! 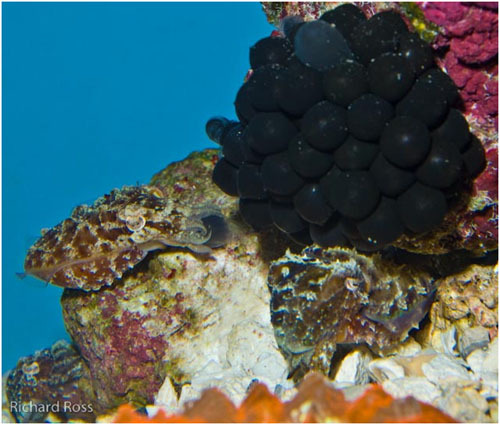 Each of the small, ink colored eggs contains a growing cuttlefish that will hatch in approximately 25-30 days. If you visit soon, you may still see the eggs. However, our aquarists will remove the eggs soon in hopes of hatching, and then raising, some new cuttlefish for the exhibit. Here's a good image that shows what to look for in the exhibit. So come visit these tentacled, color-changing flying saucers. They might be small, but great things do come in small packages. I thought the cuttlefish were the cutest fish I saw at the Aquarium during our visit there! Love them!